This coming Saturday night, the 23rd of March, we have 5 fighters representing Five Rings in what will be the biggest show in Queensland this year. First up will be Shantaram Maharaj, who has taken this fight on a week and a half notice against Mitchell Mallet. 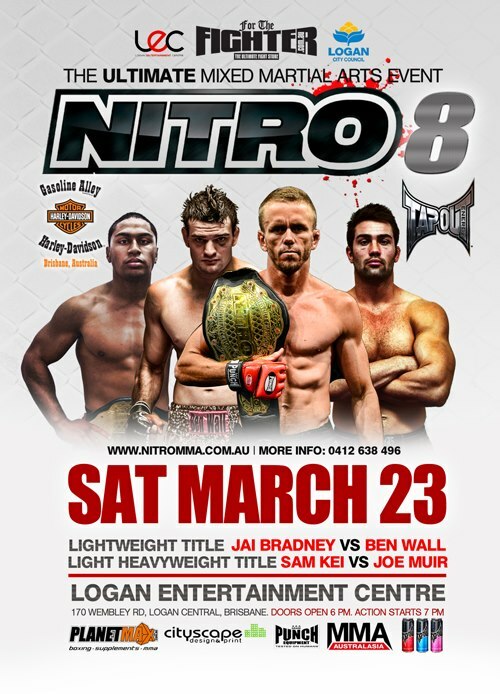 Mallett opponent had pulled out and Nitro flew Shantaram back to the Gold Coast for the fight. Matthew Frincu steps back in the cage against Rhys Murray from Integrated. 3 out of 4 of Matty’s opponents have been from Integrated so this will be another ripper of a fight. Isaac Tisdell will face off with Harley Taylor of Brisbane. Props to Harley for taking the fight on two weeks notice after Isaac’s original opponent Nathan Ngan had pulled out with sickness. Shannon McClellan takes on Shindo’s Kris Morris. The winner of this fight is promised a Title Match in July so both fighters will be more determined than ever. As semi Main Event, “The Massacre” Joe Muir takes on Sam Kei for the Nitro light heavyweight title. Sam won the Title last year with a TKO win over Kris Lokteff. Tickets are almost sold out but standing tickets should be available on the door.